Taking effective meeting minutes is an important aspect of board management. 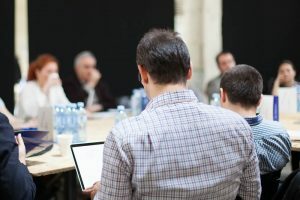 Not only do minutes provide a historical account of board actions, they help to measure progress against your strategic plan, drive accountability, and can be used as legal protection if necessary. For all of the benefits, however, the act of recording meeting minutes comes with its challenges. Many board secretaries and others responsible for taking minutes struggle with determining what should be recorded and how. To help clear up some of the confusion, and offer some best practices around taking minutes, we talked with Zenda Bowie, director of field services and parliamentarian for the Georgia School Boards Association (GSBA). Here, Bowie shares her list of meeting minutes must-haves below, along with some of her best tips as part of the Simbli Webinar Series. Note that you should always check your bylaws for any variations to these practices. Regular Meeting: Regular meetings are those meetings scheduled for the year in accordance with the organization’s bylaws. Called Meeting: A called meeting is a meeting that occurs for a specific purpose. For example, a board might hold a called meeting to discuss the purchase of an item. Bowie notes that the agenda for a called meeting cannot be amended. If the board discusses and takes action on any topic outside of the agenda, she says, the discussion and actions are moot. Special Meeting: A special meeting is one held separately from regularly scheduled meetings. A special meeting can replace a meeting that was cancelled or postponed, for example, and it must be announced. Unlike a called meeting, the agenda of a special meeting may be changed, says Bowie. Although this might sound obvious, your minutes should include the official name of the organizing body. Bowie says this is often left out because the recording secretary and the group already know the name of the organization that is meeting. However, the name should always be included in the minutes. Bowie clarifies that the meeting time you record in the minutes is the time the meeting is called to order. If the meeting was scheduled for 7:00, and for some reason it started at 7:30, the minutes should indicate 7:30 as the start time. The location should be included unless the organization meets at the same place every time. If this is the case, only include the location in the minutes of the first meeting of the fiscal year. Include the full names of the presiding officer (chair), governance members and recording secretary in attendance. If there is a substitute serving for the chair, this should be reflected in the minutes. The minutes of the previous meeting should be approved during the current meeting. Bowie recommends that the minutes of the previous meeting be distributed electronically, or by mail, as soon after the meeting as possible so that members have plenty of time to review and make corrections if necessary. Corrections should be sent to the secretary in advance of the next meeting so that valuable meeting time is not spent discussing changes to previous meeting minutes. Corrections should reflect inaccuracies, not changes to writing style, says Bowie. Many organizations require that the presiding officer and recording secretary sign the minutes once approved, she adds, so it’s important to check your bylaws to ensure the proper signatures are included. The minutes should reflect what took place in motions — the action of the board, not the dialogue, says Bowie. She adds that minutes shouldn’t include who said what (except for motions), or editorial comments such as, “the chair said emphatically,” or that he pounded the desk. For motions, include the exact wording of the statement, and the name of the person making the motion. Some organizations might require the name of the person seconding the motion, as well. Bowie adds that if the motion is not worded properly, it’s up to the chair to help the member modify the wording. The recording secretary should then record exactly what was said. It’s not the responsibility of the secretary to edit the motion, she says. Ms. Martin moved that the 2017-2018 budget be approved as amended. Mr. Avery seconded the motion. The motion passed unanimously (Voting yes: Ms. Martin, Mr. Avery, Dr. Strong, Ms. Mayfield, Mr. Octave). Amendments, points of order and appeals, even if not sustained, should also be recorded. Changing votes: One challenge many recording secretaries face, says Bowie, is when a board member wants to change his or her vote after the fact. In addition to recording the time the meeting adjourns, the person who recorded the minutes should sign them. The words “Submitted by” followed by the signature is acceptable according to Robert’s Rules of Order, Newly Revised, says Bowie. Bowie offers additional tips for taking effective minutes, including spelling out acronyms on the first reference, and sitting in a place where you can see and hear everyone. But taking good meeting minutes ultimately comes down to good communication between the secretary, members of the organization, and the chair, she concludes. Want to keep these tips handy? Download the quick guide to board meeting minutes and be sure to watch Zenda in action as part of our Simbli Webinar Series! Manage your board meetings — and your minutes — more efficiently with Simbli’s paperless board meeting management software. Learn more.